13deals.com is owned and operated by Jammin' Butter, LLC. which operates multiple sites that offer daily deals. LocoBuy, That Daily Deal, 7deadly deals and Hobo Ninja are all owned by Jammin' Butter. If you check Youtube and other social networks, you will quickly find out how popular 13 deals truly is and how happy customers are with their offerings. Jammin Butter is also registered with the Better Business Bureau and have been operating online since 2009. 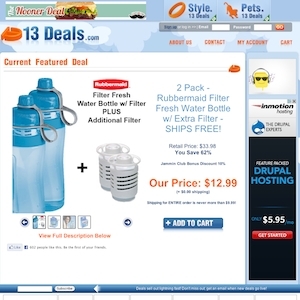 13deals.com currently ranks #86 amongst sites offering online deals -- Allheart ranks #85. In the General Merchandise category, 13 Deals ranks at #30 -- HobbyTron ranks #29. Amongst all deal a day sites, 13 Deals ranks #12 -- RIPT Apparel ranks #11.